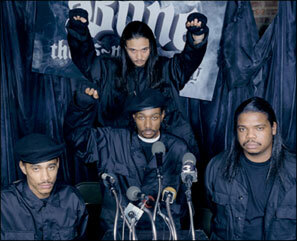 This week's video is off Krayzie Bone's album "Thug Mentality 1999". This song is krayzie as hell... TIGHT! This weeks song is "Thug Mentality LIVE". Enjoy!!!!! Week One: Friday, November 18, 2005.....Bone Thugs-N-Harmony "Resurrection (Paper, Paper)"
Week Two: Friday, November 25, 2005.....Bone Thugs-N-Harmony "Look Into My Eyes"
Week Three: Friday, December 02, 2005.....Bone Thugs-N-Harmony "Can't Give It Up"
Week Four: Friday, December 09, 2005.....Bone Thugs-N-Harmony "Thuggish Ruggish Bone"
Week Five: Friday, December 16, 2005.....Bone Thugs-N-Harmony "Home"
Week Twenty-Two: Friday, March 24, 2006.....Bone Thugs-N-Harmony "Money, Money"
Week Twenty-Three: Friday, March 31, 2006.....Krayzie Bone "Thug Mentality"
Week Twenty-Four: Friday, April 07, 2006.....Bone Thugs-N-Harmony "BET Rap City Freestyle"
Week Twenty-Five: Friday, April 14, 2006.....Bone Thugs-N-Harmony "Dayz Of Our Livez"
Week Twenty-Six: Friday, April 21, 2006.....Krayzie Bone "Thug Mentality LIVE"